Can iLogic Help You Work Faster? Most companies that are in machine design, manufacturing, or construction have many designs that are similar or contain basic standard parts. When I began 3D modeling with Inventor 4 in early 2001, it was a challenge to generate every part that was needed for a design. Gradually, we started to develop a library of basic parts that we could reuse or adapt, to use in our current design. We tried to develop many different methods of reusing a part or assembly with little actual time savings. I was introduced to iLogic right before its inclusion into Inventor 11. I started building small parts that had several variations. Now this wasn’t a great leap since we already had the iPart version. What I quickly learned is that iLogic has a great deal more versatility than iParts and it’s much easier to build. If you have read any of my other iLogic articles, I have stated repeatedly that I have very limited programming experience and I am still able to do quite a bit in iLogic. I quickly began to develop more intricate parts and some small assemblies. Now I am not going to say that this development did not take any time; it did. The first batch of models took some time to develop but I noticed that I was getting much faster at developing parts, especially since I knew what would work well and how we could get the most bang for the buck to use a euphemism. To begin with, I started to model some of our simple but frequently used parts. 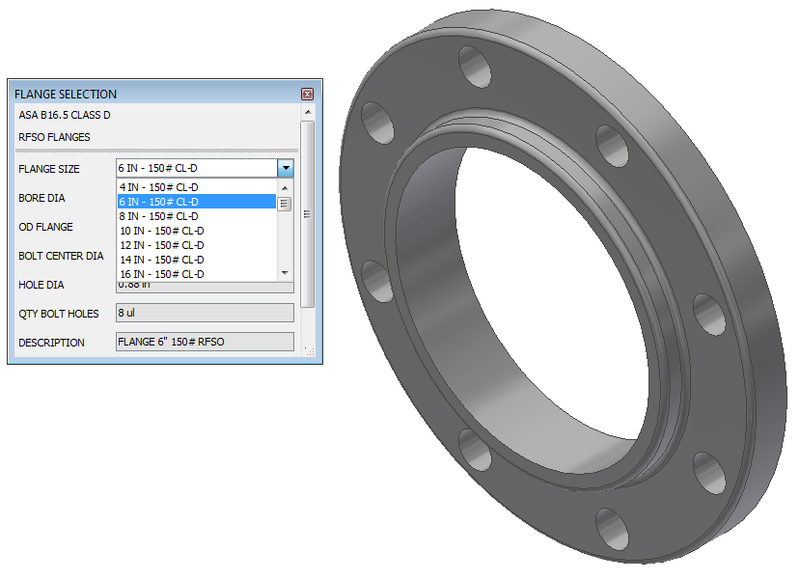 I wanted to see the time savings, if any, for a modeler creating the part from scratch or editing an existing part, compared to the time savings of using an iLogic part from our library. I started with a simple Lifting Lug. This lug had already been created several times by different modelers and it also existed as an ipart. I knew this would not provide much of a time savings, but we had to start somewhere. The part was easy to create since we had an existing model and all of the design specs. What I did not expect at the time was that I soon learned how to get the iLogic part to complete the description and change the material without having to open the iProperties. This in itself was a time saver and set us on the path of standardizing our BOM descriptions. I created the lug, shown above, in about an hour. A modeler in the best of circumstances took from several minutes to as many as ten minutes to locate, open, edit the model and update the iProperties. Finding the same part in our iLogic folder, inserting, and updating the Form took seconds. The size selection was made, the material was selected, and the description was filled out all in a few easy steps. Since we built rather large machines using steel plate, I thought that creating an iLogic Plate could save us some time. After a few months, I could only shake my head at how much time it actually did save. The plate shown below was just a simple rectangular plate that uses a Form to control the size, material and description. Looking back at how many times we created simple plates of varying sizes, it should have been a tip off. 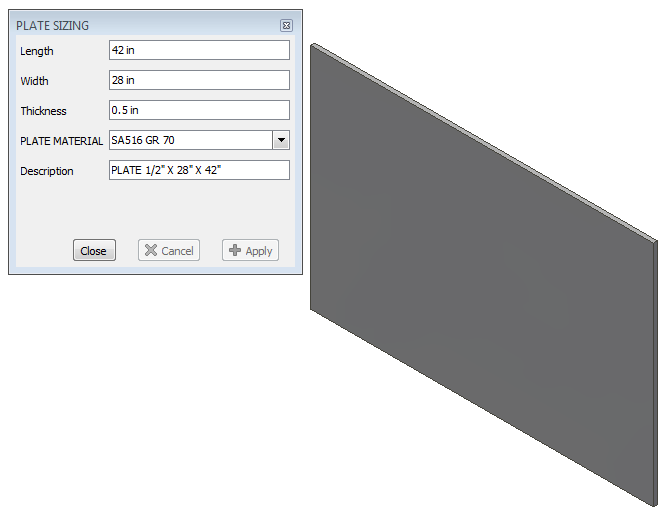 Creating a plate from scratch and filling out the iProperties took minutes. Using the iLogic Plate took seconds. That time savings in itself added up to a significant time savings when you consider how many times a day we had to create a plate from scratch. Staying with the part theme, I looked to another part that we used often and took time to create, edit or update. I decided to try to create a Raised Faced Slip-On Flange (see below). These became available later on in Content Center, but we stayed with our iLogic parts for ease of use and because we were able to select the material and automatically fill out the description the way we wanted to see it in our BOM. Here, I was again able to limit the sizes we most often used, 150#, 300#, 400#, and 600#, along with the correct description. This part took me the better part of a day to perfect since I was trying to control several features that I hadn’t worked with previously. Again, after a few weeks, it was obvious that this part was going to be a time saver compared to hunting, pecking and editing existing parts in the system that we employed before this iLogic part was created. I discovered early on that the added use of the Forms that are available within iLogic is a great way to present options and limitations to the end user. This is true within a part or assembly for selecting a model, material, limit sizes, selecting color, checking other parameters, and the description. I also employed a Form in my drawing template. By using a Form in my drawing, I was able to include only the iProperties or custom iProperties that I needed to be available to complete the information for filling out my Title Block. How often is the assembly used? What are the possible time savings? I have created more than a few large iLogic assemblies. I have also taught a few iLogic classes where the class project was a large assembly of the customer’s product line. Large iLogic assemblies take time! They will have bugs and need fixing. You will want to add or adjust the “final” model or the iLogic rules. This all takes time so you and your manager need to understand this going in. The rationale behind creating a large iLogic model vary from company to company. It can be time savings, the ability to generate a base model quickly, having the ability of your sales people mocking up a base model at a customer’s site, and more. There are many reasons but the results can be dramatic. In my iLogic classes, I have had customers smile and say that they had no idea that they could do this or that the model design was way beyond their expectations. Whatever the reasons, I have seen iLogic change how a company creates their base modeling practices. How they use iLogic parts to speed up their design process. I have also seen a company’s expectations set way too high, only to walk away disappointed that they could not get a ready-to-use model with the push of a button. Temper your expectations with the understanding of what can and cannot be done, and how much work is involved in generating the final product. My #1 advice to anyone or any company trying to decide whether to include iLogic designs in their business is to start small! Do not try to “Drink the Ocean” on your first few designs. Begin with small parts that will add time savings and help you plan your larger designs. I am a big proponent of iLogic. I have seen how it changed my modeling department, along with how I personally work with Inventor. I highly recommend that you take a look at what iLogic can do for you and your company. Need more assistance with iLogic? We can help! From training classes, to consulting work, contact us to get ahead and stay ahead.